Bypass Rte. 208, at third courthouse site. This site was the location of the third Spotsylvania courthouse. In 1722 the first county court session was held at Germanna (now in Orange County) and a courthouse was built soon after. The court was relocated to Fredericksburg in 1732. In 1778 the General Assembly permitted the county to move the courthouse again to a more central location. The first court session was held here in 1781. The County’s courthouse, jail, pillory, stocks, and gallows were built, and a clerk’s office and tavern were erected thereafter. 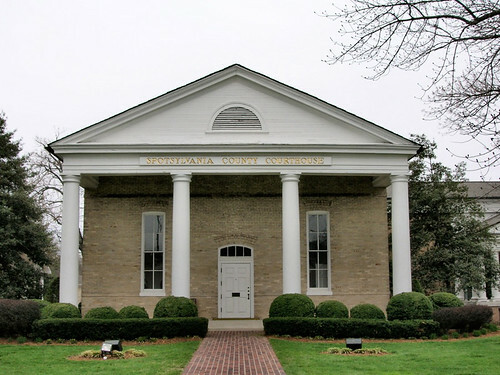 A second courthouse, built in 1800, replaced the original. In 1837 it burned to the ground, and a replacement was built nearby at the present site of the Spotsylvania courthouse. On May 12, 1918, a group of local women erected a monument for Confederate Soldiers, which they had been saving their own money to purchase. It was dutifully entitled “Monument to Confederate Dead in the Confederate Cemetery at Spotsylvania Court House” (Cummings 126). The Spotsylvania Courthouse was damaged again during the battle of May 1864. It was located very close to the Confederate headquarters and suffered structural damage in the fighting. The structure was determined instable and unsafe in 1901. It was rebuilt with mostly the same structure, with one small exception. The long-lived whitewashed brick wall around the property was removed. A small wing was added to the side of the building in 1964 (Cummings 127). Spotsylvania Courthouse is located at the intersection of Court House Road and Brock Road. Sanford’s Tavern, which was its neighboring building, was both a dining facility and also accommodated overnight travelers and guests to the court. Later named the Spotswood Hotel, this building has endured a expansive amount of time. It was built in the early 1950s as a hotel and tavern. Today it functions under a different purpose; it now holds the law offices of Jarrell, Hicks, and Sasser (Cummings 37). Brock Road led from Fredericksburg to Richmond, so travelers frequently needed a place to stay during their tedious journey on non-paved roads. “Spotsylvania Courthouse,” Courtesy of Amy Benjamin, 2008. 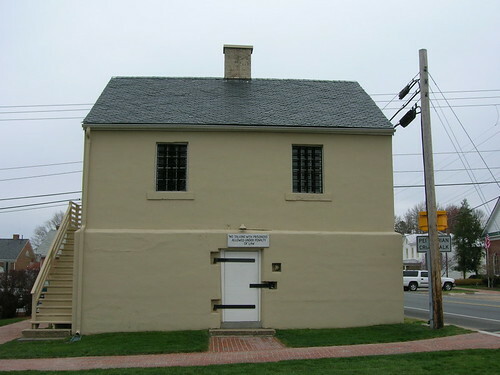 “Spotsylvania Courthouse Historical Jail House,” Courtesy of Amy Benjamin, 2008. Cullen, Joseph P. The Battles of Fredericksburg, Chancellorsville, the Wilderness, and Spotsylvania Court House: Where a Hundred Thousand Fell. Washington, DC: National Park Service Historical Handbook Series, 1966. Cummings, John F. III. Fredericksburg and Spotsylvania Court House. Charleston, SC: Arcadia Publishing, 2002. Rhea, Gordon C. The Battles for Spotsylvania Court House and the Road to Yellow Tavern, May 7-12, 1864. Baton Rouge, LA: Lousiana State University Press, 1997. This entry was posted in 1700s, 1800s, Buildings, Elle, Spotsylvania and tagged Battle of Spotsylvania Courthouse, Brock Road, Fredericksburg, Spotsylvania, Spotsylvania Courthouse, Tavern on March 17, 2008 by eweaver.